Welcome to this beautiful new facility and our thanks to the PUSD for letting us showcase one of their recently completed Prop TT projects. First let me say that is a continuing privilege to serve as your Mayor, and I appreciate your attendance tonight. I also appreciate my family’s presence as well. The City Charter requires that in January of each year, the Mayor present a thematic budget message for the stated purpose of receiving and considering public suggestions and comments on the City budget prior to its preparation and ultimate approval by the City Council. So, for the past two years I have devoted most of my State of the City speech to our finances. I have tried to provide our residents with a background on how we pay for City services and to alert everyone that the day was fast approaching when we could not rely on our current sources of revenue to adequately pay our bills. Unhappily, in spite of all the positive things happening in our City, that day has arrived. Tonight I will explain not only how this happened, but also how we can overcome this challenge by working together. Everything else, charges, fees, unpredictable intergovernmental transfers = $94.2M. 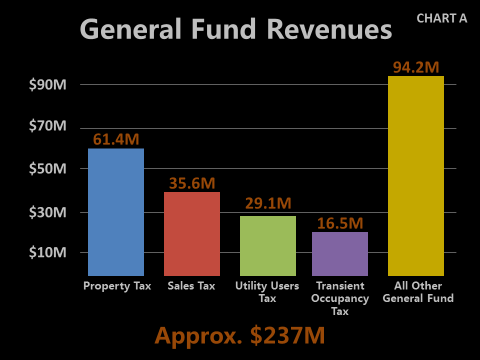 Increased development & rising property values will continue to be our primary source of revenue and revenue gains while sales and utility taxes are largely flat. 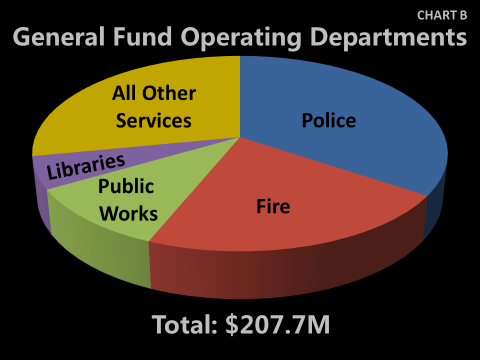 CHART B is a pie chart which shows, by Department how we spend the Revenue we collect. An additional $29M, not shown, is non-departmental, like bond debt payments. Everything else, Human Services, Planning, Transportation = $58.4M, up from $58.2M last year. The City’s contribution to the employee Retirement system—CalPERS—continues to take a growing bite out of our budget. 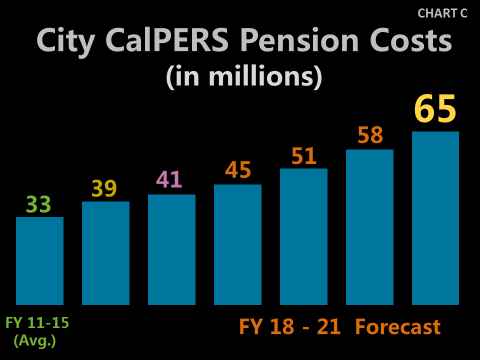 CHART C shows that the budget payments to CalPERS were remarkably stable from 2011-2015. Although our rates have soared, your City Council has worked with City employees to increase their contributions which helped to offset the increases; so our budget cost during this time held in the lower $30M range. Unfortunately, underperformance in CalPERS investments led to a jump to $39M in 2016, and last year it climbed to $41M. Four years out, the forecast is a whopping $65M; a 100% increase in six years! This is an increase from 7.5% to 13.9% of our General Fund budget, and is an obligation that is largely beyond our control. There is, however, some good news regarding our reserves; our savings account. 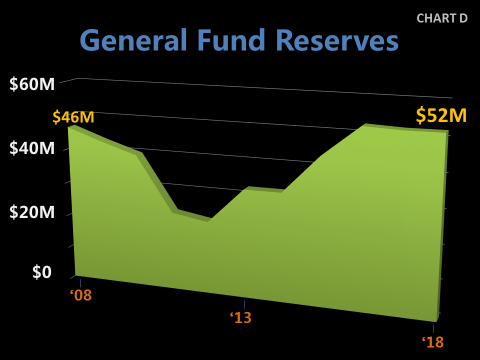 CHART D shows that in 2008, our total reserves were approximately $46M. During the “Great Recession” of 2008-2012, we drew down various reserves by $25M in order to maintain the level and quality of City services. Since then, we have been rebuilding our rainy day fund so that it now stands at $52M, which is greater than pre-recession levels. We have accomplished this by balancing our Budgets, eliminating some staff positions and adding savings generated by one time payments. Additionally, last June the City Council also allocated $12M to a special Trust for future pension and other post-employment benefit obligations, thereby further building our reserves. Still, looking ahead, if we continue on our current pattern of income and expenses, we will be in a deficit position during Fiscal Year 2019, which begins this July. 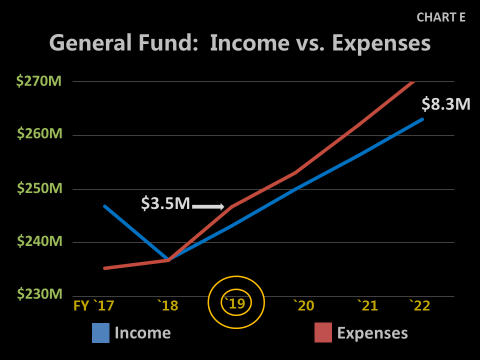 CHART E shows that expenses will begin to outstrip income by $3.5M in FY19, more than doubling to $8.3M by FY 22. This is not a sustainable outcome. So we must continue to work hard to enhance income and to reduce expenses. On the expense side, the City made significant reductions during the great Recession and has continued to make cuts where possible. Reduced local transit service by eliminating Sunday service and cutting Route 70, which served West Pasadena. While great effort has been made to maintain service levels despite these reductions, we’ve reached the point that any further reductions will have noticeable impacts. It is expected that as part of next year’s budget, every department—including Police, Fire, Human Services and Recreation, will have to reduce services. Even more worrisome is that given current projections, the City will be forced to make even more drastic cuts over the next few years which will directly impact the services our community relies on. In addition to operating budget cuts, we won’t have funds to address our many capital needs. Pasadena’s infrastructure is aging and needs significant re-investment. Repairs that are delayed often cost far more to repair when they fail. We currently spend $32M on non-utility capital improvements, but it’s not enough. We spend over $1M a year to fix damaged sidewalks, but there is $20M worth of work to do. We simply aren’t paving enough miles of streets, replacing enough failing street lights, or rebuilding enough sewers to keep up. While we have managed to rebuild one fire station and seismically retrofit another, we don’t have the money to make necessary upgrades to the remaining six. Pasadena is not alone in confronting this budgetary dilemma. Surrounding cities are facing the same issues and many are considering significant personnel and service reductions to meet the projected shortfalls. My sworn duty as your Mayor is to preserve the good health and the future of our City. Rising costs, including pensions, mean that unless we increase our revenue, we must make material reductions in City services, including public safety. Therefore, I will ask the City Council to place a 0.75% sales tax increase before the voters on the November, 2018 ballot. This would generate $21M annually and allow us to avoid cutting services too deeply, and will also generate capital funds for reinvestment in critical facilities such as Fire Stations. Further, I would ask the voters to consider an advisory measure that would share 1/3 of the proposed tax (a quarter cent) with the Pasadena Unified School District. The PUSD is facing its own significant budget challenges and if they are to continue their efforts to improve educational outcomes for our children, they need our support. We cannot have a great City without a great public school system. Raising the sales tax is a big ask. It will impact every resident, visitor and business in our City. It is not a request that I make lightly or without trepidation. However, I believe that it must be done and that once the voters understand what is at stake, that they will support this proposal to secure our City’s future. There will be a great deal of public discussion about this proposal in the coming months, and I hope that you will participate. I assure you that the City Council and the staff will continue to work hard to limit expenses and to generate additional income for the City in order to maintain services at the high level that you expect. While we face financial challenges and we continue to grapple with chronic problems like homelessness, lack of affordable housing and managing development, we also have lots of positive things going on in our City. ARROYO SECO—For the past year, a citizen Task Force has been hard at work developing their suggestions for priority projects, funding mechanisms and implementation methods. They will be presenting their ideas to the City Council next month and we hope to begin making positive changes this coming year. OFFICE OF THE YOUNG CHILD—Pasadena has declared its intention to invest in our youngest residents and to become an Early Learning City by 2025. The effort is headquartered in the Library Department, and they began their efforts with a wonderful young family event in the Arroyo last September. MAJOR CONSTRUCTION PROJECTS—This year saw the completion of 460 new housing units, the initiation of construction of a new Hyatt hotel, a new HMRI research building, the new Kaiser Permanente Medical School, and the Chen Neuroscience Center at Caltech. Also, Doheny Eye Institute purchased the former Avery headquarters. I was reminded tonight that perhaps the most important construction project of the past year is the one that will not get started. The rejection of the 710 Freeway extension by a unanimous METRO vote means that we can begin planning on the reintegration of the stubs and work with our neighbors, including Alhambra, to craft 21st century solutions to our transportation needs. IMPORTANT REGULATIONS—After extensive public discussion, the City Council adopted new rules governing home sharing, accessory dwelling units, and marijuana which will all have major impacts on our future. We are also placing charter election reform changes on the June ballot to comply with State law. ARROYO SECO WEEKEND MUSIC AND ART FESTIVAL—In June we saw the debut of the new event which will be a long term contributor to the financial health of the Rose Bowl. In sum, the state of our City is good; we are truly blessed as a community. With your support, we can stabilize our finances, continue to strengthen our institutions and secure an improved quality of life for all of our residents. I hope that this evening has been useful for you & I must thank those who helped put it together. Special thanks to Marshall, its Principal Dr. Anderson, students & faculty. From the Office of the Mayor & City Council: Rhonda Stone and Jana Stewart; Pasadena Media’s Chris Miller, Bobbie Ferguson and Danny Hesse; Finance Director Matt Hawkesworth and Public Information Officer William Boyer; from the Department of Human Services: Horace Wormely, Kenneth Graham and Dolores Mendoza; our Police Explorers, and Northwest Program Ambassadors; and of course, our City Manager Steve Mermell.